We’ve come to learn, as far as finding things on our PCs, Cortana isn’t the fastest gun in the Wild, Wild West. If you’re searching for something on your computer, we’re going to show you a faster way to find it, and it’s easy to use too. Up above the file/folder/drive listing you’ll see a very faint search box with “Search this PC” barely visible. See above. Let’s zoom in, shall we? 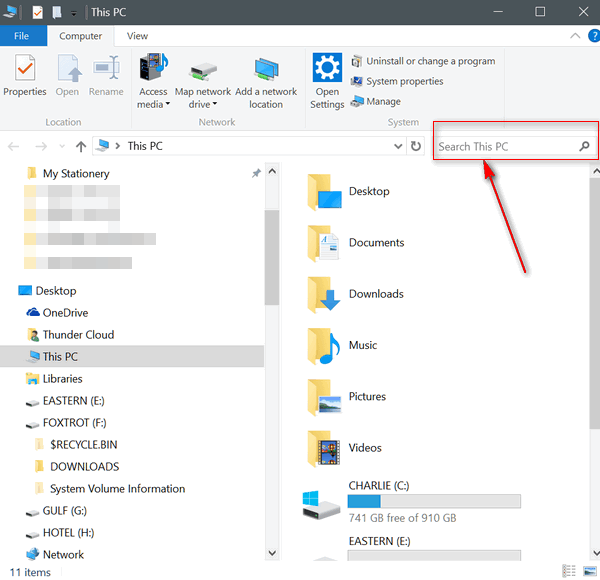 Apparently, Microsoft wants you to use Cortana as they don’t make this optional (and faster) search very noticeable, but thanks to our resident Hawkeye, EB, who discovered this little trick, we can all search our Windows 10 PCs a little faster! Another helpful hint. If you know the folder that the file you’re looking for is in, switch to that folder first and then search – it’s even faster! I find when I am looking for something such as a photo for my digi scrapbooking if I don’t have the exact name typed in it will find zippo. Drives me crazy. Maybe this will help or I will have to rename a million photos!! !